This two day visual thinking training will be facilitated by some brilliant German friends and colleagues on a USA tour! They'll be teaching in various cities throughout their tour + have chosen to stop off in Philly! VISUALS for CHANGE facilitates a similar training about twice per year in NYC focusing on helping you find your style. 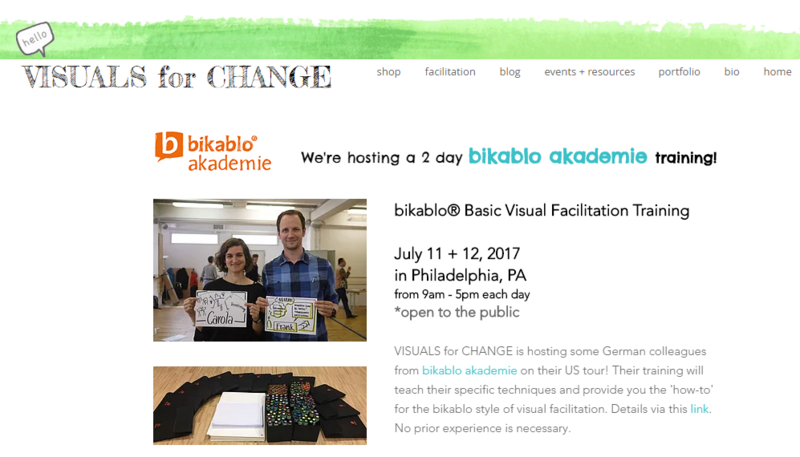 This training will teach you the specific 'how-to' for the bikablo technique of visual facilitation, providing specific ways to draw + organize your paper. It's always good to learn from different styles! We're super excited to host Frank + Carola in Philly! No prior drawing experience necessary.